The program will include: My Fair Lady, Fiddle-Faddle, Marche Des Parachutistes Belges, Pas Redoublé, Recorded by Sinatra, Shenandoah. 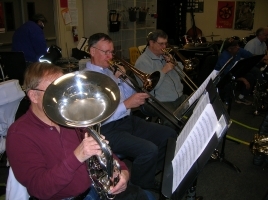 The Hot Auburn Winds Big Band Ensemble will be performing several numbers! This event has been viewed 128 times.